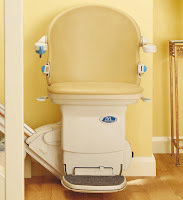 Castle Comfort Stairlifts offers top brand stairlifts, keen prices and fast installs for all those seeking stairlifts in Nottingham. And all work comes with our no-quibble guarantees and famous customer service satisfaction. Give us a call today on 01559 717 012 If however, you are looking for fascinating facts about the area then feel free to read on. Due to ever increasing demand Castle Comfort Stairlifts have now got a Nottingham office serving the East Midlands region, which includes those looking for stairlifts in Derbyshire Leicester or Peterborough too. As part of our series of regional and city blogs this one will give you fascinating facts about the area as well as linking you to information on buying stairlifts in Nottingham a city famous for many things but I hope to uncover some new facts that will surprise you. An Englishman's home is his castle and Nottingham has it's own castle built on a hill with far reaching views over the town. Intriguingly it's built on Castle Rock, which has a network of stairs and cave passageways carved out underground, beneath the castle. In the time of Edward III it was invaded by troops who had found a stairway that led from Englands oldest pub located down below in the town and went through the rock to the castle. It must have been handy for the castle owner to pop downstairs for a tipple! This area is well known for the bands of robbers, outlaws and highwaymen around these parts, and no I'm not talking about other stairlift firms!! Of course I'm talking about Robin Hood and his Merry Men those Nottingham legends that have had many books and films made about their story. But did you know that Nottingham has also been featured in some other films? The Golden Globe, Academy Award and Bafta nominated actress Samantha Morton hails from Nottingham and has filmed here. Though it might be Albert Finney and Hylda Baker, who starred in TV sitcom Nearest and Dearest with Jimmy Jewel, whose names are more familiar to you starring together in BAFTA winning Saturday Night Sunday Morning which was filmed in Nottingham. Another legend well known in the area who took two East Midlands clubs to spectacular new heights in football was Brian Clough. Infamous for being passionate and opinionated about the game he nevertheless took first of all Derby County and then Nottingham Forest onto great achievements. At Derby he got them promoted to Division 1, won the league cup and helped them set an undefeated 22 match record. At Nottingham, with his help, they went from 8th in Division 2 to winning the Division 1 League cup and back to back European cup championships including a record breaking undefeated run of 42 games. Talking football, Stoke City have in their time played Notts County, Nottingham Forest and Derby County. Stoke is where Castle Comfort Stairlifts have their head office. If you want to see how you can get round a curved set of stairs with less cost then see their chair lift cartoon with a Stoke City rider! Other sports that Nottingham is known for is of course it's cricket. Trent Bridge being one of the finest international cricket venues, (and third oldest ground in the world.) It's here you can watch England play international cricket with the best in the world. Other sports that Nottingham are known for with national centres of excellence are its National Ice Centre and in Holme Pierrepont the National Watersports Centre where every year an Ironman Triathlon is held. Competitors swim a couple of miles, cycle over a hundred then run a gruelling marathon - all in a day. If tackling the stairs is getting as demanding for you and you'd like to make life easier for yourself why not try a riser recliner chair from Castle Comfort in Nottingham. Their direct number is 01159 717012 and they would be pleased to tell you more about their huge range of helpful mobility products including adjustable beds bath lifts and wheelchairs. 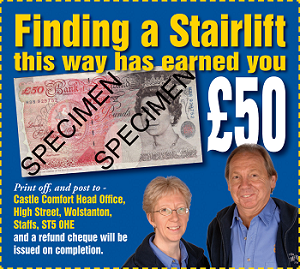 Here below, as with all our regional stairlift blogs, we have the main towns and cities in the county of Nottinghamshire – along with a selection of notable residents – past and present. It’s always remarkable, how many people do not know just who comes from their own town. Arnold – Andea Lowe, actress. Arthur Knighton-Hammon, Painter. Attenborough – Robin Hood – needs no introduction. Beeston – Sir Paul Smith, Fashion Designer. Bingham - Ian Storey- Moore, Former Footballer. Frank Miles, Artist. Bulwell – Bertie Mee, Arsenal Football Player. Partrick Doyle, Songwriter and member of pop group ‘The Diamonds’. Carlton – Richard Beckinsale, Actor. Cotgrave – Ernest Hayes, Britsh Army Soldier. Eastwood – Jeffrey Astle, West Bromwich Albion and England Footballer. D.H. Lawrence, Author. Hucknall – Lord Byron, Poet and Philosopher. Eric Coates, Composer of theme tune for ‘The Dam Busters’ movie. Kimberley – John Reynolds, British Superbike Champion. Kirkby-in-Ashfield – Sam Hynde, 2008 Paralympic- double Gold Medalist in Swimming. Mansfield – Chris Gascoyne, Coronation Street’s Peter Barlow. Alivin Stardust, Singer. Mansfield Woodhouse – David Gray, Singer. Newark - Sir Godfrey Newbold Hounsfield, inventor of the CT scanner. Toby Kebbel, Actor starred in ‘Rock ‘n’ Roller’. Retford – Phillip Jackson, Actor best known for his role in Agatha Christie’s Poirot. Liam Lawrence, Football Player for Stoke City FC. Southwell – Lord Byron, Poet. Stapleford – Tom Johnston, Football Manager and Player. Sir John Borlase Warren, Admiral. Sutton-in-Ashfield – Andrew Lewis, Composer. Kris Commons, Footballer for Stoke City, Nottingham Forest, and Derby County. West Bridgford – Harry Wheatcroft, famous rose grower. Worksop – George Best, Footballer. Bruce Dickinson, Iron Maiden Singer. Here below, we also have the main towns and cities in the county of Derbyshire – along with a selection of notable residents – past and present. It’s always remarkable, how many people do not know just who comes from their own town. Alfreton – Sally Pepper, BBC Weather-Girl. William Mugliston, 18th century Poet. Ashbourne – Dave Tyack, Guitarist and Singer. William Corden the Elder, Artist. Belper – George Brown, Labour Politician. John Lawton, Novelist. Birchover- Eddie Shimwell, Blackpool Footballer. Bolsover – Mark Morris, Author. Steven Blakeley, Actor. Burton-upon-Trent – William Bass, Founder of the Brewing business. Alastair Yates, presenter of BBC News and BBC World News. Buxton – Vera Brittain, Author. Bruno Langley, Coronation Street Actor. Castle Donington – Brian Henton, F1 Driver. Castleton – William Dawkins, found important fossils in Castleton. Chesterfield – Paul Burrell, former Royal Butler. Phil "Philthy Animal" Taylor, former Motörhead Drummer. Church Gresley – Ted Clamp, Footballer. Clay Cross – Authur Henderson, Nobel Peace Prize winner 1934. Dronfield – Vinnie Jones, Footballer and Actor. Rick Allen, Drummer of Def Leppard. Elvaston - William Darwin Fox, early work on dinosaurs and introduced his second cousin Charles Darwin to the study of insects. Etwall – Miles Hunt, Singer in pop band ‘The Wonder Stuff’. Eyam - Richard Furness, the Poet of Eyam. Glossop – Mark Berry (Bez), Singer and Dancer in the group ‘Happy Mondays’. John Aston, former Manchester United Player. Hartington - James F. Redfern Sculptor, was born here in 1838. Hartshorne - Katie Lewis, best known for saving the lives of 10 people in the Old Bakery Fire. Hathersage – Fiona MacCarthy, Historian and Biographer. Hayfield – Authur Lowe, Actor appeared in TV show ‘Dad’s Army’. Heanor – Henry Garnet, exectuted for his role in the gunpowder plot. Long Eaton – Georgia Groome, Actress. Dougie Squires, OBE – Choreographer. New Mills - Geoff Simpson: International multi-award winning Nature Photographer, Naturalist and Writer. Osmaston – Henry Royce, Car Manufacturer. Ripley – Barnes Wallis, Inventor of the ‘Bouncing Bomb’. Risley - Sir Hugh Willoughby, the Navigator. Rosliston – Ann Moore, the fasting woman of Tutbury. Sudbury - William Harcourt, founder of the British Association for the Advancement of Science. Swadlincote – Joe Jackson, Musician and Singer-Songwriter. Tideswell - Ric Lee, Drummer of the blues/rock band Ten Years After. Tintwistle – Vivienne Westwood, Fashion Designer. Whaley Bridge – Betty Driver MBE, Coronation Street’s Betty Williams. Woodville – John Hurt, Actor. I just dreampt that for my old age I can have a ' riser recliner chair / stairlift ' and that would be the only one in Nottingham! Imagine stetching our and relaxing going up to bed! Have Castle Comfort Stairlifts thought about putting a Stairlift up from "The Trip" through Nottingham Castle - very appropriate ! - and then the possibility of going up into the castle - possibly on a stairlift after a few pints !